There's no way around it. Unless you happily live alone and are independently wealthy, holidays bring stress. It might start with the money – how to stretch your budget around gifts and the extra expenses at the grocery store. It might start with trying to live up to other's expectations. It might start with knowing you'll be spending time with people who love to criticize you. It might start with trying to fit all the extra activities into an already-full schedule. 1. Do the "sigh and look up" exercise. Simply let out a big sigh while looking toward the heavens. This helps release pent-up negative energy. It's also a great exercise to do when someone you love tests your limits. Instead of blowing up, just sigh and look up. 2.Take Feel5ive from Feel Bach! Get your bottle of Feel5ive today and enjoy the holidays! Oh – one more thing. Your pets also experience holiday stress, so put a few drops in their water dish each day when things around your house begin to get hectic. The holidays often bring melancholy to those who long for "the way it used to be." No present celebration brings joy, because today's celebrations are not the same as yesterday's. People are missing –through death, through divorce, or through children growing up and moving on. Sometimes it's good friends who have moved away and left a void. Big noisy holiday dinners, with perhaps 20 friends and family members around the table, become a thing of the past. Cooking for only one or two is depressing rather than joyful, and the longing for how it used to be prevents finding new ways to make the holidays special. Feeling nostalgia for happy times is natural and normal, but when those feelings destroy enjoyment of the "now," they need to be addressed. The sufferer needs to move forward, accept change, and find enjoyment in today while still retaining and cherishing good memories of the past. 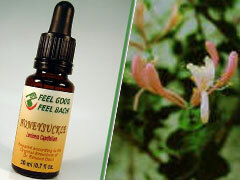 Honeysuckleis the Bach Flower Essence that will help re-balance those energies and allow a person to live well in the present.